Are you looking for a gift or just indulge yourself? 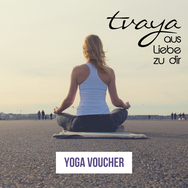 Here you will find carefully selected yoga and beauty/wellness products from Tvaya, Lotuscrafts, RINGANA and vitasation. Just give away a yoga trial class or a private session. Make your order and I will send you an email with my bank details. After receipt of the payment you will get the personalized voucher via email. The voucher is valid for 6 months. 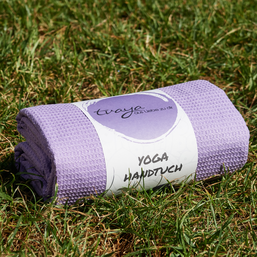 The violet and petrol-colored yoga towels by Lotuscrafts are of high quality and ecological. It is fun to look at, touch and use the towel. At the same time, from the beginning to the end of the production chain as well as in all work-processes, attention is paid to a resource-saving approach to people and environment. Just pick it up at the studio. SIMPLY SKIN - the "Beauty Kit from inside". Sustainably produced, vegan/vegetarian and natural superfoods and fresh cosmetics: a present that will certainly give lots of joy and, of course, freshness! Should it be a specific product? Let me know and I will advise you personally. After ordering, you will receive the bank account details via email.